The London Irish Volunteers were founded at the Freemasons’ Tavern, Great Queen Street on 5th December 1859 during concerns over the threats posed by Napoleon III, and which prompted the rise in the Victorian Volunteer Movement. The Marquess of Donegall presided at the original general meeting. 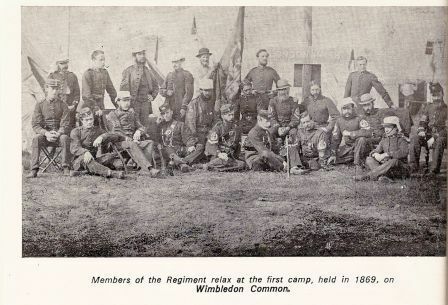 On 3rd September 1880, under the Cardwell reforms and along with other Middlesex regiments, the Battalion was re-numbered as 16th Middlesex (London Irish) Rifle Volunteer Corps, and in 1881 became a Volunteer Battalion of the Rifle Brigade. During the Queen’s Jubilee year in 1887, the regiment kept the ground at Buckingham Palace on the occasion of the Royal Procession to Westminster in June, and took part in the review by the Queen of 63,000 men at Aldershot. In 1889, Lt-Col Howland Roberts became Honorary Colonel before succeeding Colonel Ward as Commandant in 1896. During this period, the Regiment took part in several Royal Reviews including those for the Jubilee at Buckingham Palace in 1887, and the Royal Review at Windsor for the visit of the German Kaiser in 1891. 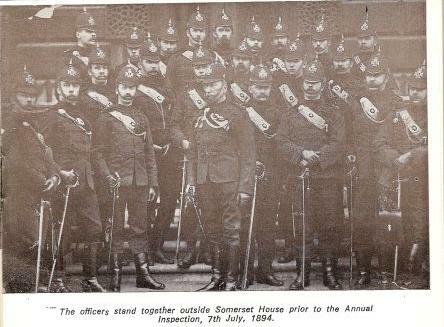 General Roberts also commanded the military contingent at the funeral of Lord Tennyson in 1892 – the dark uniform of the Regiment being eminently suitable for the occasion. When in 1892, the Royal Warrant authorising the Long Service Decoration for 21 years of service, three officers were entitled to receive this decoration, along with the Duke of Connaught – these being Colonel James Ward, Colonel Howland Roberts, and Lt-Col Lloyd. There were also 22 NCOS and privates, who had served continuously for 21 years at that time. In April 1897, Colonel Ward died, being replaced as Commandant by Colonel Roberts, who saw the regiment through the Boer War.